MK-V NEXUS (Steadicam) – complete with full Radio follow focus , zoom control systems etc, HD video sender packages for all camera formats. All Hard mounts and stablisation aids required for high speed tracking etc. Full Backup Spare Support Kit for the above. Complete AR OMEGA REVOLUTION SYSTEM – again with complete backup spare. Full adapted Radio Follow focus kit and HD video Sender Packages to suite camera format. Vehicle mounts etc. 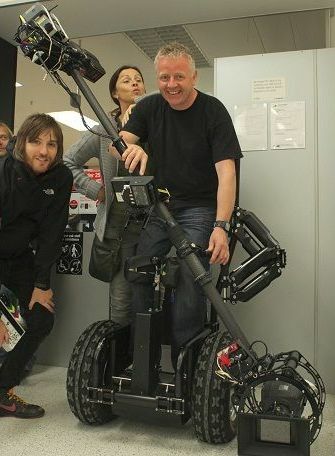 SEGWAY TRACKING PLATFORM capable to carrying both Steadicam and the AR Omega Revolution systems. Complete with Hard mounts with all necessary additional spare battery kits to allow continuous unrestricted shooting. Full set of wheels and tyres for all surfaces. Complete AR Omega Revolution system with very latest softwear updates. Can be provided as a separate unit or part of a complete system package mounted to the MK-V Nexus System above.